As Hurricane Florence approaches, Historic Rock Hill wanted to share some very helpful resources for you to help prep your historic home before the storm as well as what to do with your family heirlooms if disaster does strike. One of the greatest things about all holidays are the traditions and Rock Hill sure has a great one every Fourth of July! The Johnsonville Parade has been going on for at least forty years but to many people outside of the neighborhood are not familiar with it! By July, some of the summer break patina can wear off. When the Johnson children asked their father what they could do one hot Independence Day, he suggested a parade around the neighborhood. What began as a small troupe of the Johnson children and their neighbors slowly evolved into a wonderful Rock Hill tradition. The parade has grown over the years to even include the campers at Camp Cherokee who travel down from King's Mountain State Park to walk, decked out in red, white, and blue. Original founders, the Johnson siblings sing with new neighbors, Brittany & Michael Kelly who will help keep the neighborhood tradition alive. Each year, the City of Rock Hill looks to the community to recognize the heroes among us. Those local heroes who fought for freedom and justice, not just for those locally, but also those across the US. These heroes are then recognized and remembered as a part of the Freedom Walkway. Past heroes include Brother David Boone, who fought for integration and civil rights, and Jim Williams, who led the Black Militia in the 1870s to combat the KKK. One or more local heroes will be honored and celebrated this year. The Freedom Walkway Interpretation Committee is seeking nominations of individuals or groups who have made a significant contribution to the cause of justice and equality for all citizens. The deadline for nominations is June 29, 2018. If you would like more information or to nominate a local hero, please visit the Freedom Walkway website. Did you know that Historic Rock Hill regularly sends out eblasts to keep you up to date on the happenings at the White Home and around town? Subscribe below to stay up to date with Historic Rock Hill! Interested in keeping up to date with Historic Rock Hill? In 1937 a man and his camera came to Rock Hill to film the daily lives of the average denizen. As a way to supplement his income during (& after) the Great Depression, H. Lee Waters, a photographer living in Lexington, NC, traveled throughout North & South Carolina, Virginia, and Tennessee. In a time where one of the few indulgences taken by many people was purchasing a movie ticket, Waters filmed daily lives of local communities and gave them an opportunity to "see yourself in the movies." Waters filmed the daily life of Rock Hill's citizens, including shots at the high school and downtown street scenes as well as shots of Winthrop and the Bleachery. He also sold advertising for local businesses to show during the public viewings. A still from “Clayton (N.C.), circa 1936-1937 (Reel 1),” one of the films in H. Lee Waters Digital Collection. After retiring, H. Lee Waters sold the original reels back to the cities he had once visited. After being stored for years, Historic Rock Hill (or the Midtown Preservation Society as we were known at the time) was able to show the silent film in November 1987. While it had been available to the local schools, the film was largely forgotten after the showing. Historic Rock Hill & the City of Rock Hill have fortunately recovered the original film reel! We hope to be able to digitize the film and show it to the public in the coming year! If you would like more information about supporting the project, please email our Program Director at info@historicrockhill.com. One of the best ways to stay involved with Historic Rock Hill is to read our monthly eBlasts! They are a great way to see what Historic Rock Hill is doing, get information on upcoming events, and learn about exhibits and programs! Our March eBlast just went out. Click below to see what's coming up at the White Home! 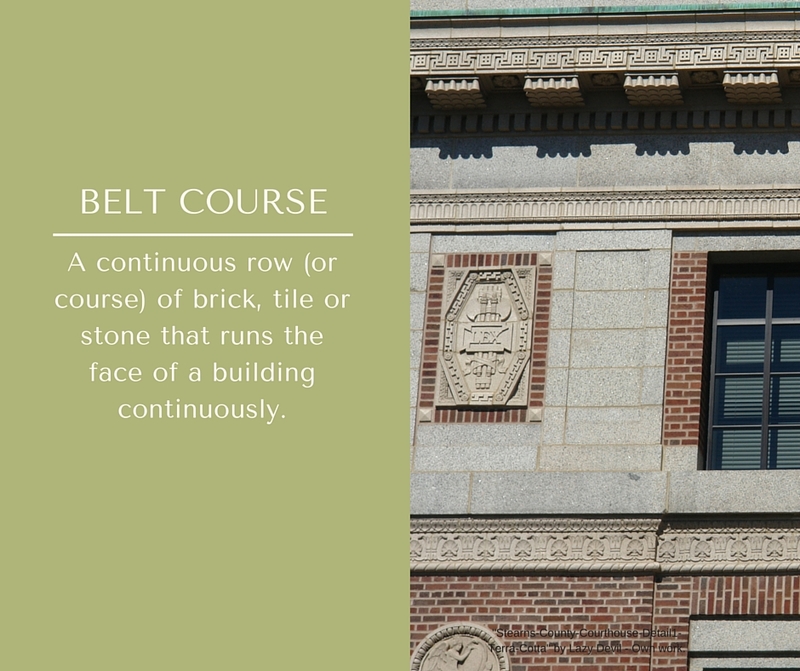 B is for: Belt Course is a row (also called a course) of bricks, tile, or stone that runs the length of a building contuniously.